wonderfull panoramic villa on the sea. Villa with Amazing Sea views! Villa Oleandro is very beautiful 4 bedroom and two leveled villa located in a residential area with a wonderfull sea view. located in Massa Lubrense, and exaclty in San Montano Riviera it's just 4 km away from Sorrento which offers great restaurants and beaches. The beach is only 300 meters from the Villa and other beaches are very easy to reach. Sea, green vegetation and colorful flowers. Two of the master bedrooms have en-suite bathrooms and two bedrooms share a bathroom. One of the master Rooms also has an extension with one small bedroom with two single beds for children. The family / living and dining room is extremely large, spacious and bright with wall to wall large glass bay windows looking out to an amazing views of the sea, the famous Capri Island and the Gulf of Naples. The villa can host from 6 to 8 guests. There are restaurants and bars very close by. You may take a walk down to the sea. The villa has a private covered parking space on the street level. It is situated on a hill top over the sea Which offers comfortable winds. The entire villa offers Amazing Views! There is a bus stop just a few minutes walk from the villa, from where you may take a bus to Sorrento and the surrounding towns all along the Amalfi Coast line. Once you are in Sorrento you may take the train to the well known archaeological sites of Pompeii, Herculaneum and Paestum, as well as the famous city of Naples. Villa Oleander is situated high enough from street level with nothing hiding it, leaving the villa with openness to the bright sun and blue sea. The villa offers very large spacious areas indoor and outdoors. The villa has all wooden sliding doors with large panoramic window views. There is A / C in the living room, two bedrooms and in the hallway That leads to all the rooms. The kitchen is fully equipped with dishwasher, refrigerator, freezer, stove and oven range. There is a flat screen TV in all the bedrooms and living room. Wi-Fi access Throughout the Villa. A courtyard with BBQ area. This terrace is the first one you will encounter where you will find chairs and table where you may want to sit and relax after a long day at the beach or out on an excursion and simply enjoy the views. The large terrace has wooden lounge chairs, a table with chairs where you can sit and enjoy the breathless views. This terrace can be accessed either from the outdoor stairway or from the dining / living room area. This is the area in the back of the villa. It is enclosed and nicely surrounded with plants. The wooden table and chairs can accommodate 10 people with a BBQ grill for your outdoor entertaining dinners. The villa is accessed from the main road by going up Approximately 50 easy steps. Once you enter into the villa you will be on the main floor lobby and there are wooden sliding doors That leads to the 2 master bedrooms, 1 master suite with extended bedroom and two bathrooms. All the rooms have a front door access and another That back door leads out to a hallway That connects all the bedrooms with large arched glass windows offering amazing panoramic sunrise and sunset views! This bedroom has a matrimonial bed That can be split into two single beds. There is a flat screen T. V with closet and glass sliding door That leads to a hallway That connects all the bedrooms with bay windows That offer an amazing view of the sea! Has a bathtub with shower, sink, toilet, bidet and built in linen wooden dresser. There is a window with view over looking the back hallway and amazing panoramic sea view. Has a matrimonial bed with closet, flat screen T. V and A / C. There is a sliding glass door leads to a hallway That That connects all the bedrooms with large glass bay windows That offer an amazing view of the sea! This is the largest Master Bedroom with matrimonial bed, flat screen T. V, A / C and an open area with dresser That leads to a small bedroom with two single beds. There are sliding glass doors That bring you to the connecting hallway, However may be totally closed in with another door. 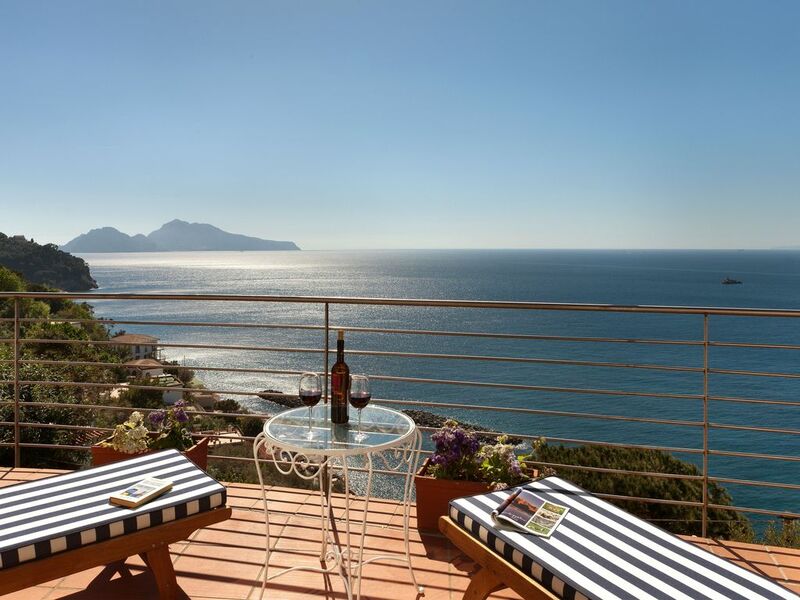 There is a large bay window That offers the beautiful view of the sea and the gulf of Naples and the Island of Capri. There is Also a private That door leads outside. This bathroom has a wonderful huge walk-in shower Which is all tiled. There is a sink, toilet, bidet and window with sea view! There is a large wooden spiral stairway That leads you up to the second floor, where you will find the entire entertaining area with the family room, dining room, living room, the out door terrace with the most amazing views, courtyard with BBQ area and fully equipped kitchen. Spacious Living Area, Great for Entertaining! The dining room has a wooden table with chairs and can accommodate 8 people. The family room is nicely furnished with leather sofas, an armed chair and coffee table. There are two steps Bringing you to the living room area with other sofas and coffee table, fireplace and a TV. One can enjoy the breathless views thanks to the panoramic windows That features the entire area. That will bring you to the garden or entrance stairway. This home is very beautiful with numerous very private sleeping areas so that multiple couples could easily share this home and feel like they had their own privacy from one another. Several beautiful outside sitting areas with incredible views and wonderful sunsets every night. Fully stocked kitchen, clothes washer and very comfortable beds. Awesome place to stay for several days to explore the sights in the area. The location is perfect. This is great for family. We were 9 people and had no problem for the space. Andrea was very kind and helpful for solving any issues we requested to him. I would definitely come again! Mais qu'attendez-vous pour résider dans cette magnifique villa ? La maison est très spacieuse, très bien équipée et la vue sur la baie de Naples et sur Capri est extraordinaire, changeant tout au long de la journée. La plage, au bas de la villa, accessible en 3 minutes à pieds, est très agréable et le port de Massa Lubrense lui aussi accessible à pieds comporte des restaurants très sympathiques. Le propriétaire de la villa est toujours joignable et organise à votre demande toute demande de transferts ou d'excursions ce qui est très appréciable. De très très belles vacances assurées.